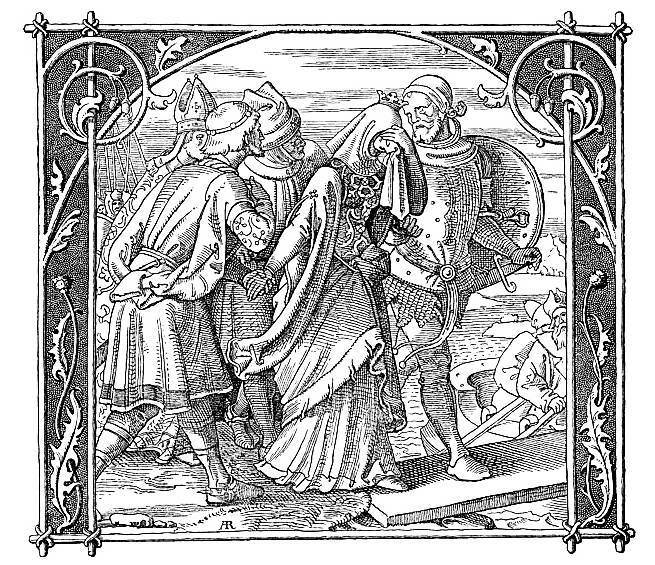 Decorative wood-engraving by Alfred Rethel (1816–59). Decorative illustration. Artist: Alfred Rethel. Engraver: Unsigned. 4 x 6 inches. Das Nibelungenlied. Leipzig: Wigands, 1840  The illustration exemplifies the use of a rustic border, typical of the style of German illustration of the 1830s and 40s; signed AR, in imitation of the monogram of the master wood-block artist, Durër.